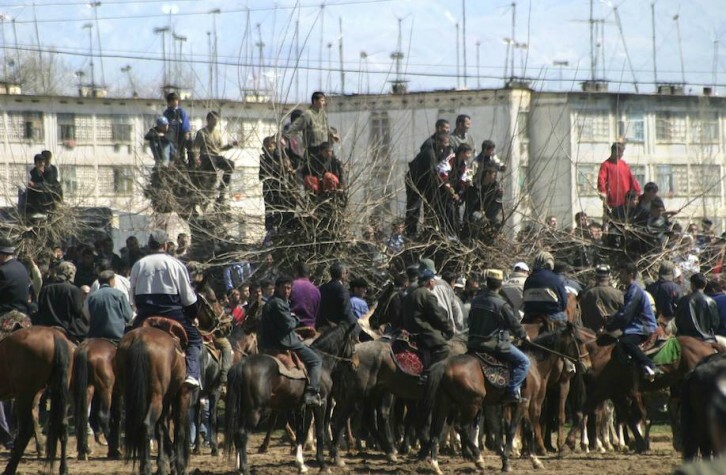 A kind of Central Asian polo, buzkashi is played on horseback between two teams of riders competing to win possession of a headless goat, calf or sheep carcass (the buz) which is then carried and thrown across the opposition’s goal line. 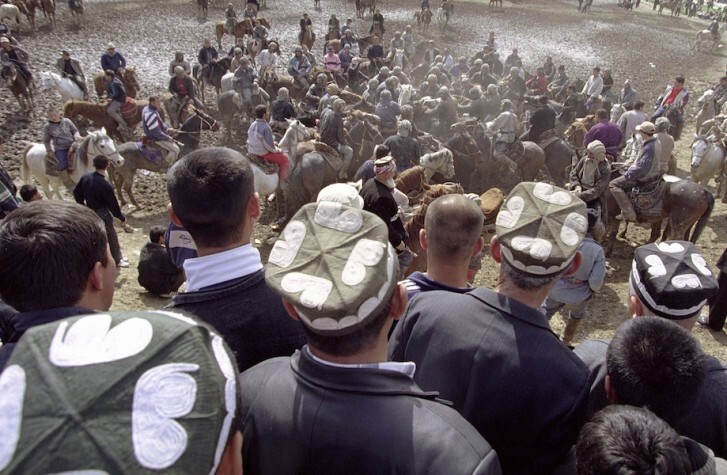 Known in Tajikistan and Afghanistan as buzkashi (‘goat grabbing’), the sport is referred to as kokpar in Kazakhstan (‘goat contest’) and ulak tartysh in Kyrgyzstan and Uzbekistan. While the name varies, the game is essentially the same across the region, where it can be enjoyed throughout the summer (with the exception of Afghanistan, where it is a winter game). The largest matches are held during Nauruz (Persian: New Year) celebrations in late March. A match begins with riders (chapandaz) competing in a ferocious mêlée – like a rugby scrum on horseback – to grab the buz. The animal is normally slaughtered the night before the match and soaked in water to increase its weight. Riders form teams or play as individuals. Their use of old Soviet tank helmets and vivid Turkmen saddlecloths often gives the air of a country pantomime to the matches. While fighting to grab the buz, the chapandaz slide across the shoulders of their mounts, clinging to the high wooden pommels of traditional wood-framed saddles. Block-heeled leather boots thrust deep into short stirrups keep the riders anchored, allowing them great agility as they stretch over their horse’s backs. Once in possession of the buz, a chapandaz attempts to gallop away from the other players. But it is never a clean fight, and the mêlée can last just a few seconds or up to half an hour. The horses (all stallions of seven years old or more) become frenzied and froth blood, their mouths cut and brutally wrenched by the reins. Like mediaeval warhorses, they bite, kick and rear in the struggle to get nearer the buz buried deep among the players. Horses and men fall and roll alike. Whips are used with abandon. Great palls of steam rise from sweat-drenched horses, and in the summer, dust billows upwards, stinging the eyes. The players swirl around the buz like the currents of a whirlpool, maybe a dozen horses, maybe forty or fifty, sometimes a hundred or more, often at the mercy of the rise and swell of the group. For the player, a glimpse of the carcass is like a jolt of electricity spurring him on, whip locked between teeth, driving into the chaos. Younger players who are still learning and older men past competition age ride in circles on the periphery. Only the strongest and most senior riders (some of the best chapandaz peak only in their forties and also train as wrestlers) stand a chance of grabbing the buz. Increasingly, larger, heavier horses are becoming dominant, used like battering rams to break into the pack. But strength must be paired with agility. Suddenly the mêlée will break when a chapandaz, galloping free and straining to clamp the carcass under his stirrup, makes for a distant flag at the opposite end of the field. The point will be won by rounding the flag and returning the carcass to its starting point. The distances involved vary, and in some matches breaking clean itself constitutes a win. The chase is now on with the rest of the field in hot pursuit. Often two players will gallop side-by-side struggling in a tug-of-war, hauling different legs of the carcass and stretching it like a shirt on a washing line. A truly first-class chapandaz can hold the calf (which might weigh up to forty kilos), whip his horse and deflect opponents, all while galloping at full tilt and swaying pendulously to maintain balance. Boundaries are not fixed and the chase may career in any direction. Crowds of shrieking spectators scatter before the horses while the slower, if unlucky, tumble between the horses’ hooves. It is during this free running that buzkashi most magnificently reflects the ancient nomadic traditions that gave rise to the game. Buzkashi probably originated on the steppes of Central Asia in the thirteenth century as a means of honing defensive skills used to protect livestock against Genghis Khan’s mounted raids from the Mongol lands to the north. 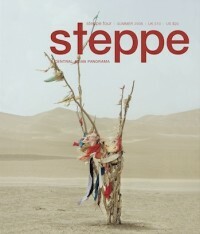 Indeed, the very survival of nomadic communities depended on speed and agility on horseback. Buzkashi was a means of enhancing crucial equestrian skills and promoting the ideal of a heroic partnership between man and horse. Today, the game keeps these skills alive and connects communities to their nomadic cultural heritage in which, as in the great Turkic dastans (epic poems) such as Alpamysh and Korroglou, horses are heroic figures. In one of the earliest printed versions of Alpamysh, buzkashi is referred to as kok boru (blue-white wolf) – a term used today by the Pamir Kyrgyz now settled in the region of Lake Van in eastern Turkey, suggesting their ancestors played using this animal which was also a symbol adorning the standards of the early Turkish khanates of Central Asia. Today, the heroic ideal and a reputation for success are still sought after by chapandaz and horse owner alike. Stable owners tend to be traditional landowners, businessmen or politicians who can afford the considerable investment involved in purchasing and keeping horses and providing prizes for matches. Good horses can cost thousands of dollars. It is an expensive folly; as a stable owner in Afghanistan said, ‘it’s daft and expensive but it’s our national game’. The self-aggrandisement inherent in lavish expense, however, makes it worthwhile. Having rounded the flag at the far end of the field, the pack of chasing horses returns. The chapandaz who manages to place the carcass back at its starting point (often marked by a chalk circle) collects a prize and the match soon resumes. Prizes become increasingly valuable during the match (which can last up to three hours) and might vary from a $20 bill to a television or even a four-wheel-drive jeep. The player, not the owner of the horse, keeps the prize, but it is the reputation as a winning chapandaz and the respect of the community that matters more. But just as a chapandaz wins respect, so does his horse. Indeed the horse is often said to be as important as its rider. In the words of one Tajik chapandaz, ‘they are not horses you know, they are dragons’. Leo Docherty is a travel writer. He is currently writing about an overland journey by horse, bicycle and foot from Istanbul to Kabul to be published by Faber & Faber in 2012. His first book, Desert of Death: A Soldier’s Journey from Iraq to Afghanistan was published by Faber & Faber in 2007.